As you progress through ChefVille you will find more recipes that require Salt and/or Pepper. 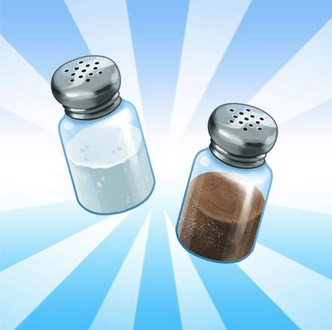 I have seen many people asking how they can get Salt and Pepper so I decided to write a short article about obtaining these ingredients. Don't worry it is actually very simple! Step #1. Get ChefVille Friends- If you don't have any friends that play ChefVille, click on Add Neighbors at the top of your screen. You can then invite any of your Facebook friends to become your neighbors in ChefVille. Step #2. Visit Your Neighbors & Help Them Out- Click on your neighbor's picture at the bottom of your screen to visit his or her restaurant. Once you are at your neighbor's restaurant help them out 5 times (You can help each neighbor a maximum of 5 times every 24 hours). After doing so you will receive 1x Salt and 1 Energy. Step #3. Complete Step #2 Three Days In A Row- After 3 consecutive days of visiting the same neighbor you will become a Regular and start receiving Salt and Pepper with each visit. You will continue to receive Salt & Pepper as long as you don't miss a day. If you do miss a day you will go back to Basic. 3 consecutive days of visiting your neighbor will bring you back up to Regular status. 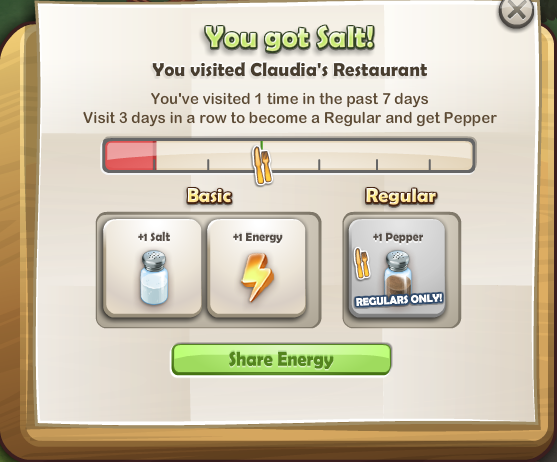 Please comment below if there are any other ways of obtaining Salt & Pepper in ChefVille. Thanks For Reading!